Apple is loved by millions for the innovative designed and advanced technology of its products. While the company is also committed to offer a high level of security, there are threats that require additional protection. When you connect to internet, your online activities may be monitored by others, including hackers who want to steal your information. The best option to protect yourself from cyber crime, online surveillance and other risks is to use a VPN. 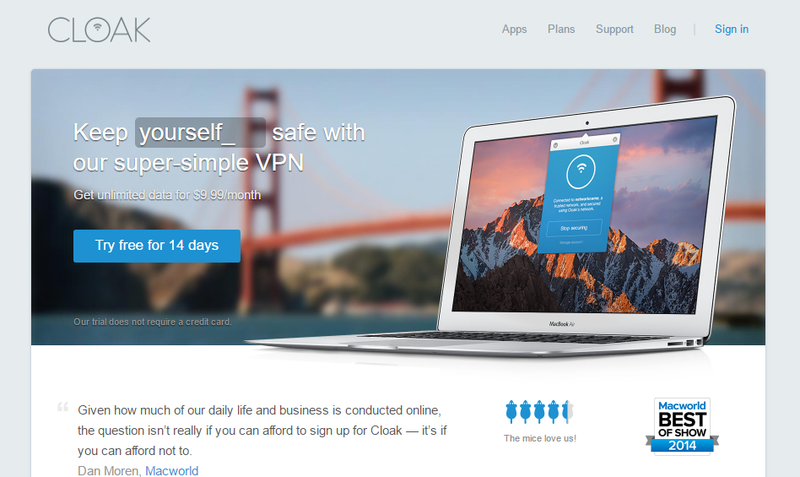 Cloak VPN is a US-based VPN provider that focuses on helping Apple users to enhance their security when they connect to the internet. The service is designed to help you to prevent eavesdropping and attacks that can compromise your privacy. It is particularly important to take measures to defend your information from possible security threats when you use public WiFi hotspots and Cloak VPN adds strong protection to keep your data safe, no matter where you are. Here is more about Cloak VPN. Public WiFi hotspots are very convenient and they can be found in a wide variety of places including hotels, coffee shops and public transport. When you are on the go, public WiFi hotspots can seem like a blessing but it is important to keep in mind that your information is more vulnerable to attacks when you use these networks. Malicious users may exploit the security weaknesses of public WiFi to get access to your information. If you are not protected, they would be able to see what you do online and steal personal and financial information. However, if you use Cloak VPN, all the traffic that goes between your iPad, iPhone or Mac and the the internet is encrypted. This means that a secure tunnel is created to cover your data and ensure that others can’t see it. Cloak uses OpenVPN and IPsec protocols, which are secure technologies that provide a high level of protection. On top of that, the level of encryption applied (AES 256-bit and RSA 2048 bit encryption) is very strong and it will prevent other parties from seeing what you do online. With Cloak, you can browse internet, chat with friends and family, access online banking, check your social media accounts and more, knowing that your data is protected even if you are using a public WiFi hotspot. Cloak can detect if you are connecting to a trusted WiFi network. If it determines that the network can’t be trusted, it secures your connection automatically to ensure that your information is not compromised. By default, the WiFi networks that are password protected and non-WiFi networks are set as trusted. However, you can adjust the settings so that Cloak always enables its protection to maintain a high level of security whenever you connect to the internet. Cloak is an ideal solution for users who often need to connect to the internet using public WiFi hotspots. The VPN will keep all your online traffic secure, giving you peace of mind at all times. In terms of privacy, Cloak states that it doesn’t monitor your online activities. They don’t keep logs of the websites you visit, your conversations or anything else that you do when you are connected to the internet. In that sense, Cloak is a good solution to enjoy your browsing and use applications without worrying that others may snoop on your connection. However, it is important to keep in mind that Cloak does keep some connection logs including the duration of your session and your IP address. These details are kept for up to 16 days and they are collected for troubleshooting and to ensure that the service is not being abused. Since they are based in the US, they comply with local regulations and will respond to authorities requests. This is something to keep in mind if you are worried about NSA surveillance. In addition, P2P is not allowed and if its determined that you are involved in copyright infringement, your account may be disabled. It is important to keep in mind that Cloak is mainly designed to help you to secure your personal information and to keep your traffic protected from online threats when you use public WiFi. It is not intended as a tool to keep you anonymous and it doesn’t claim to provide complete privacy. The Mac software for Mac and the app for iOS offer high quality design and are user friendly. You will be able to install Cloak on your Apple device within a few minutes and the interface displays the status of your connection and all the information that you need to manage the security of your data. You have the possibility of adjusting the settings to select the networks that Cloak can consider as trusted. Cloak will automatically activate its security in all the networks that you have not marked as safe. Apart from improving the security of your connection, another advantage of using a VPN service is to be able to bypass online restrictions. With Cloak Transporter, you will be able to connect to a server in a different country so that you can access content that is blocked in your location. You can easily connect to a server in another country and currently, Cloak gives you options in Japan, Australia, United Kingdom, United States, France, Germany and Netherlands. If you don’t need to switch to a server in another country, you can simply let Cloak select the fastest server available and enjoy the best possible speeds. Cloak offers three options that adapt to different requirements. The Unlimited plan is designed for people who need a VPN on a regular basis to boost the security of their connection, and use public WiFi hotspots without concerns. The price for this plan is $9.99 per month. You can save money if you pay for a full year because the price per month is reduced to $8.33. If you only want to use Cloak during a short trip, or prefer not to commit to a subscription, you can opt for a temporary pass. The price for a weekly pass is $3.99. They also offer a Mini Plan that comes with a limit of 5GB of data per month and it costs $2.99 per month. In addition, Cloak has a solution for teams, which lets you manage multiple accounts and billing in a centralized way. This plan starts at $7.99 per month. Claok gives you flexibility to enjoy the service for as long as you want and in the way that really suits your needs. We also like the fact that there is a free trial that lets you use the service for 14 days, without having to provide your card information. You can find a great deal of information about the service on the website, as well as guides, a comprehensive support FAQ and a blog. If you need personalized assistance, you can contact them via email. Cloak is a great addition to any Mac and iOS device since it provides a great level of security for your personal information when you use public WiFi hotspots. The service is focused on providing an additional layer of protection for your online traffic, but it is not intended as a privacy tool or as a solution to stream media content that is subject to geo-restrictions. While it may work to unlock websites and some videos, the main purpose of Cloak is to help you to safeguard your data from the possible dangers that lurk public WiFi hotspot and networks that are not secured. If that is exactly what you need, Cloak is an effective, easy to use service that is worth considering. 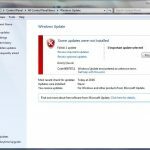 How to Fix Windows 8/10 Update Error "80073712"